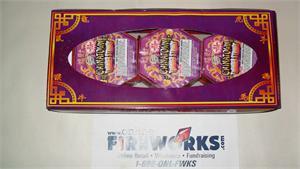 10K Triple Head Bomb Firecracker Thunder String - 12 feet of cracking finale magic whip crackling noise. Home > NOVELTY FIREWORKS > SALES & SPECIALS > 2018 New Products > 10K Triple Head Bomb Firecracker Thunder String - 12 feet of cracking finale magic whip crackling noise. Hang from a nail or tree and watch and listen to the 6 feet mirrored magic whips with crackles and bangs - sounds like firecrackers but legal version. Red and green color beads also show well at night with gold crackling. Magic Whips 1 Pk of 6. Safe and Sane Registered.